Too Many Webmasters Are Webamateurs! It’s happened to all of us. We’ve been to a website that we expected to work correctly, but of course, it didn’t. Who should we blame for these functionality problems? The webmaster. A webmaster is defined as “A technician who designs or maintains a website.” Notice in that definition the mention of “designs.” Almost all web designers forget about an extremely important part of their job: browser ubiquity testing. I discussed this topic before, but I see so many silly mistakes on the web that the topic is always at the front of my mind. A great example of a major web faux paux can be seen below. Can you believe that Merrill Lynch calls Google Chrome an “incompatible browser?” They say their compatible browsers are IE 5+, Netscape 7+ and Firefox 0.8+! How long has it been since their webmaster actually thought about their site’s compatibility? The Netscape browser isn’t available anymore, IE 5 is history, and Firefox has been through ELEVEN version updates since this message was implemented. Where is the webmaster?! A great example of a major web faux pas can be seen below. 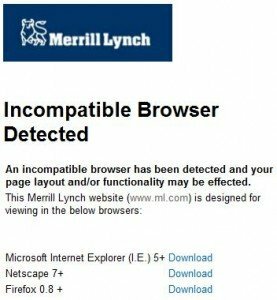 Can you believe that Merrill Lynch calls Google Chrome an “incompatible browser?” They say their compatible browsers are IE 5+, Netscape 7+ and Firefox 0.8+! How long has it been since their webmaster actually thought about their site’s compatibility? The Netscape browser isn’t available anymore, IE 5 is history, and Firefox has been through ELEVEN version updates since this message was implemented. Where is the webmaster?! Merrill Lynch has a webamateur! This is just one example of a lazy or inept webmaster. I’d estimate that 80% or more of the websites on the internet have some browser compatibility issues. Website troubles are not limited to the small-budget businesses that throw together sites, as you can see in the example. I wonder how much money Merrill Lynch spent on their website. I wonder if they know their site still does browser detection for browsers that were released in early 2004 – SIX years ago. I went to their site today after reading your post (more than a month after your post) and I still got the same message as you. I guess they don’t even have alerts setup to see if any blog mentioned their company. Wow… so old school!